Greenwood Village, CO – The Coalition for Sepsis Survival (C4SS), a Colorado-based nonprofit organization, is excited to announce a partnership with the HealthONE system to join the mission to save 10,000 Coloradan lives from the deadly medical condition known as sepsis. Over one million people are affected by sepsis in the US each year, of which over 280,000 do not survive, which is more than the number of deaths from breast cancer, stroke, and auto accidents combined. Sepsis is also the most expensive hospital condition, reaching almost $24 billion in healthcare costs in 2013. Sylvia Young, President and CEO of HealthONE, stated, “We are excited to join the Coalition and support their mission to reduce sepsis morbidity and mortality. HealthONE is a leader in providing the highest quality patient care and our North Suburban Medical Center is the very first hospital in the state of Colorado to receive certification from The Joint Commission for its sepsis program after undergoing a rigorous on-site review in October 2016. Through this partnership, we look forward to sharing our experience with other Colorado hospitals.” Gary Winfield, M.D., Chief Medical Officer for HealthONE, will lead the C4SS’s medical advisory board. The collaborative program has three key objectives: 1) Public Service Announcements – 50% of the general public has never of the word sepsis. Through PSAs the public will be alerted to recognize the signs of sepsis and urged to seek prompt medical care; 2) Research – In conjunction with the University of Colorado School of Medicine, the Coalition will explore the broad range of hospital mortality and establish standardized metrics for hospital reporting; and 3) Education Outreach – the Coalition, along with HealthONE, will provide education programs to hospitals across the state focused on the effective diagnosis and clinical management of sepsis. HealthONE is the largest healthcare system in the metro Denver area with more than 10,000 employees. As part of the HealthONE system of care, The Medical Center of Aurora, North Suburban Medical Center, Presbyterian/St. Luke’s Medical Center, Rocky Mountain Hospital for Children, Rose Medical Center, Sky Ridge Medical Center, Swedish Medical Center, and Spalding Rehabilitation Hospital work together to provide a higher level of care. In addition, our family of services includes seven hospital free-standing emergency departments and numerous ambulatory surgery centers, CareNow urgent care and occupational medicine clinics, physician practices, imaging centers, and AIRLIFE-DENVER, which provides critical care air and ground transportation across a 10-state region. And, as one of the top ten corporate philanthropists in the metro area, HealthONE contributed more than $1.5 million in 2016 and supports over 100 organizations through cash and in-kind donations. The Coalition for Sepsis Survival (C4SS) is a Colorado-based nonprofit organization whose mission is to significantly reduce sepsis mortality and morbidity by leading state initiatives to build sepsis awareness and best practice treatment. Their initiatives bring together hospitals, healthcare organizations, and businesses into a coordinated partnership that is committed to reducing the mortality and morbidity of sepsis. For additional information on C4SS and our initiatives, go to FightSepsis.org. Greenwood Village, CO – The Coalition for Sepsis Survival (C4SS), a Colorado-based nonprofit organization, is excited to announce a partnership with the University of Colorado School of Medicine. C4SS will be working directly with Dr. Adit Ginde, Professor and Vice Chair for Research in the Department of Emergency Medicine on the development of a sepsis algorithm to identify and define standardized clinical parameters so that all hospitals will be evaluated equally with respect to their sepsis mortality rates. C4SS is initiating a Colorado Hospital Sepsis Survival Study, which will evaluate the variability in the primary diagnosis, treatment, and coding practices in healthcare institutions that treat patients with sepsis. According to the Centers for Disease Control and Prevention, sepsis is a medical emergency. Sepsis is a complication caused by the body’s overwhelming and life-threatening response to infection. When sepsis is not diagnosed early and treated rapidly, it can result in tissue damage, organ failure, shock and ultimately death. Over one million people are affected by sepsis in the US each year, of which over 280,000 do not survive. Furthermore, sepsis kills over 3,000 Coloradans each year, more than breast cancer, stroke, and automobile accidents combined. Current publicly available data reveals that sepsis mortality rates, across 41 leading Colorado hospitals, vary from as low as 7% to as high as 35%. The Colorado Hospital Sepsis Survival Study will explore and systematically evaluate compliance with clinical guidelines to develop standardized screening protocols and coding guidelines, and to identify best practices and transferrable implementation components. C4SS is currently recruiting all hospitals in the state to participate in this study. The study abstract will be shared with all participating organizations. Financial grants and financing to implement sepsis process improvement programs will be provided to health care institutions that qualify. The Coalition for Sepsis Survival is a Colorado-based nonprofit organization whose mission is to raise awareness of sepsis in the community and bring together hospitals, healthcare organizations, and businesses into a coordinated partnership that is committed to reducing the mortality and morbidity of sepsis. For additional information on C4SS and our initiatives, go to FightSepsis.org. Greenwood Village, CO – The Coalition for Sepsis Survival (C4SS), a Colorado-based nonprofit announced their mission to significantly reduce sepsis mortality rates in Colorado. Sepsis is a medical condition that kills 3,000 Coloradans annually, more than breast cancer, stroke, and auto accidents, combined. Sepsis costs the US healthcare system over $24 billion annually. Yet, over half of the public has never heard of the word. Colorado is leading the fight to reduce sepsis mortality and morbidity. The Coalition for Sepsis Survival (C4SS) has begun an initiative calling on the community, including Coloradans, healthcare providers, local businesses, state government, and media to work together to make Colorado the US leader with the lowest sepsis mortality rate. Lt. 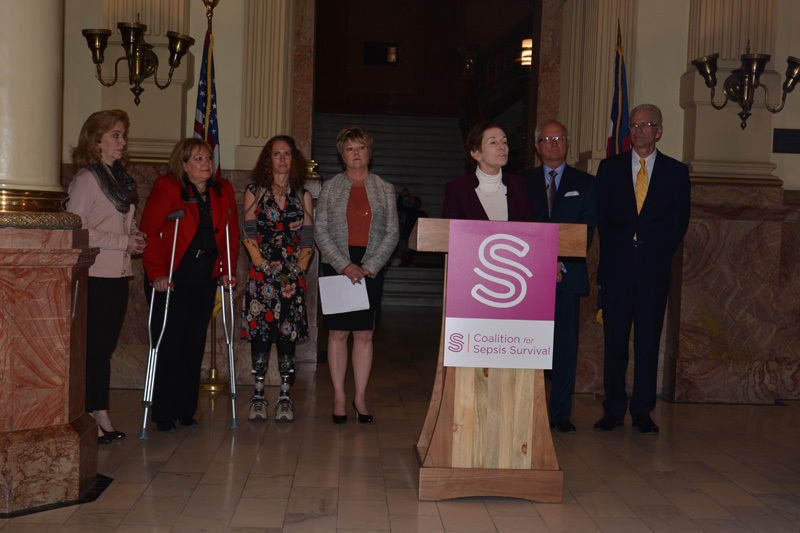 Governor Donna Lynne launched C4SS’s initiative at a press conference on October 12, 2016, during which she stated, “I am here to applaud the Coalition for Sepsis Survival’s new initiative aimed at saving thousands of lives in Colorado and reduced healthcare costs”. The press conference can be viewed at FightSepsis.org. The Colorado Hospital Association is the leading voice of the state’s hospital community. Through CHA, Colorado’s hospitals work together in their shared commitment to improving healthcare in Colorado. Julie Lonborg, CHA VP of Communications and Media Relations, stated, “Sepsis is an important issue for Colorado and one that CHA has worked on for a number of years…we wish the Coalition for Sepsis Survival the best success in this important endeavor”. We are excited to announce the Coalition for Sepsis Survival’s press conference on October 12, 2016 at 1:30 pm in the West Foyer of the Colorado State Capitol. We will introduce our initiatives for reducing Colorado’s state sepsis mortality rate by at least 50%, saving over 10,000 Coloradan lives and $200 million in lower healthcare costs over the next five years. Please show your support of our efforts by joining us at this important event! Greenwood Village, CO – The Coalition for Sepsis Survival (C4SS), a Colorado-based nonprofit organization, is excited to announce the official launch of our statewide sepsis public awareness campaign. In partnership with the Colorado Broadcasters Association and KUSA Channel 9 News, C4SS has produced and distributed the first in a series of Public Service Announcements (PSAs) to over 230 public radio and television stations throughout Colorado. Over 3,000 Coloradans die from sepsis each year, more than breast cancer, stroke, and automobile accidents combined. Yet, surveys have shown that less than 50% of the general population is aware of sepsis or knows exactly what it is. Due to this alarming statistic, C4SS has created a strategy to raise public awareness of sepsis across the state of Colorado and to help save 10,000 Coloradan lives over the next 5 years. Through the PSA programs and other initiatives, C4SS supports Governor Hickenlooper’s goal to make “Colorado the Healthiest State” in the US. What is sepsis? Sepsis is the result of an infection caused by a cut, injury or medical procedure that does not heal. It is also known as septicemia or “blood poisoning”. The symptoms of sepsis – Fever, difficulty breathing, low blood pressure, fast heart rate, and mental confusion. Early intervention is critical. Get to your ER immediately. 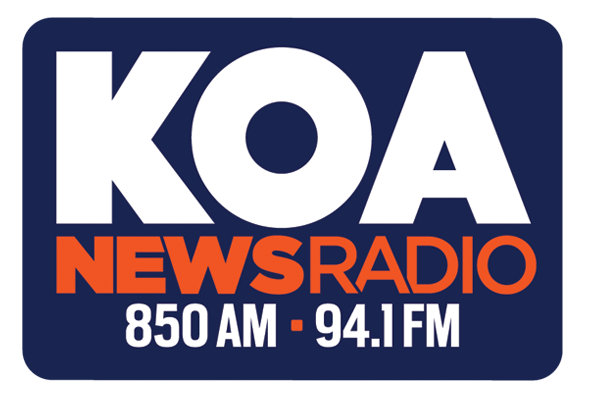 Listen to hear our interview held on KOA News Radio 94.1 Denver! Denver, CO – (June 21, 2016) – The Coalition for Sepsis Survival (C4SS), is a non-profit organization dedicated to encourage early recognition and effective treatment of sepsis, and to decrease mortality rates through partnerships focused on public awareness and support to hospitals. C4SS appreciated the timely opportunity to continue to raise awareness through an interview with KOA’s morning show co-host, Steffan Tubbs. “We are working to bring some awareness around sepsis principally to patients and families because with sepsis, which is a condition where your body is responding to an underlying infection…the body starts to respond in an inflammatory way”, stated Pamela Popp, Advisory Board Chair and Co-Founder. In February 2016 C4SS participated at the SCCM Annual Conference in Orlando, Florida! 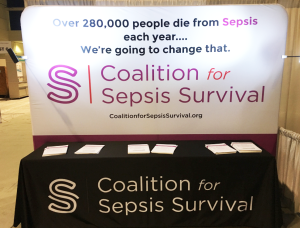 “I got tired of watching my patients die (of sepsis)” said one of the many physicians stopping by the Coalition booth during the SCCM conference here in Orlando, when asked why he was interested in decreasing the sepsis mortality rate at his hospital. In this case, the hospital sought out a grant and was able to hire a nurse project manager to focus on their sepsis program, with great mortality reduction results. Unfortunately, when the grant ended the next year, they were unable to keep the position and their mortality rate crept back up. This is a story that we are hearing time and again from physicians, nurses, pharmacy and lab personnel as well as researchers when they stop by the Coalition booth. All want to focus their hospital on sepsis, but cannot seem to find the funding, or attention, needed to get a sustainable program in place. This is how we can help. The Coalition is an objective voice bringing awareness to sepsis, so that patients get to the hospital earlier and appropriate treatment can be started. We are learning how we can best be of service to the healthcare providers, by bringing them support and resources, and confirming that they are not alone in their efforts. And to each and every one of the advocates that we meet, who are fighting the uphill battle to bring awareness and save lives…thank you for all that you are doing each and every day.